Mitchel "Mitch" Chockla, 97, passed away peacefully at home on 3/21/2018. He was predeceased by his parents, Michael Chockla and Mary Barron, all 16 of his siblings, wife of 51 years Anne Wirdzek, daughter Susan, grandson Michael Scott, great granddaughter Shyanne, and son-in-law Steve Smith. He is survived by son Mitchel "Buz" (Elaine), daughters Mary Anne Smith, Eileen Heard, Barbara Woodward, 15 grandchildren, 20 great grandchildren and a gazillion nieces and nephews. Mitch was born and raised in Derry, PA. 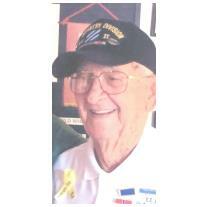 In 1942, he enlisted in the Army, serving in the Infantry&apos;s 3rd Division "Rock of the Marne" in WWII. He earned a Purple Heart and two Bronze Stars, and the French Legion of Honor while serving in North Africa, Italy and France. He returned home in 1945 after being wounded in 1944 near the German border. He was one of 6 brothers to serve in WWII and return home from battle - a true band of brothers! Mitch and Anne were founding members of St. Thomas the Apostle Catholic Church in South Miami. Their faith and love of God was evident in their lives. They moved to South Miami in 1951. He was a mailman for South Miami Post Office, retiring in 1980. He then worked at Homes Sales Window/Glass Co. in South Miami for 15 years before retiring for good! Mitch was funny, sweet, kind and caring as well as ornery sometimes. He loved to tell stories, make up songs, write and play jokes. He was a hero to all who knew him. He leaves a large hole in our hearts. Viewing will be held Wednesday, March 28th at 1:30pm with Mass following at 2pm at St. Thomas the Apostle Catholic Church, 7377 SW 64 Street in South Miami. A military funeral service will be on Thursday, March 29th at 1pm at Florida National Cemetery, Bushnell, FL.